Buy All-in-one Brother DCP 385c with CISS with CISS and make 30 times more quality prints for the same money! Pay only 0.04 USD for A-4 full color print! We would like to present you the Brother DCP-385C - a compact and stylish multifunctional device. This multifunctional printer allows you to print, to scan and to copy documents and photos quickly and easily. Due to widescreen LCD display 3.3" and memory card support you will able to view and edit photos before printing without PC Brother printers DCP-385C, with its attractive ergonomic design is a compact equipment, which allows you to print, copy and scan important documents and photos at home or in a small office. A convenient LCD display allows to view and edit photos before printing. The PictBridge support and memory cards allow to print directly without PC connection. 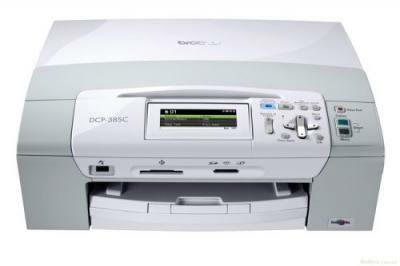 DCP-385C Brother, as well as the MFP Brother MFC-6490CW, allows you to scan and then to save the images, to transfer them by email into the optic text recognition program, in an image, in a file or USB-drive; to print and to scan from the USB-drives. The multifunctional printer, as well as the Brother MFC-J265W, is made in white-grey color tonality and equipped with a small panel for buttons and control elements and an uplifting display. The elements of control are intuitively simple and provide comfortable management for the device. Compact size of the MFP allows you to place the device in a small office rather easily. An additional advantage is cartridges placement: they are installed in front of the device, and to replace them you should not open the scanner section. Also pay attention to the cartridge design. It is a block of four separate containers with ink. 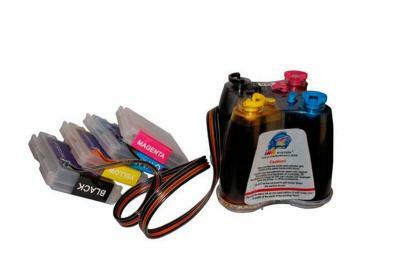 This means that after full discharge of one of the colors, it is not necessary to change the entire cartridge, you can replace only one container, which is out of ink. This cartridge design allows you to save enough money for the consumables, so that it makes this multifuncional printing device more convenient and attractive for purchase. MFP tray design in the Brother DCP-385C wireless all-in-one inkjet printer allows you to print easily on cards, labels, photo paper, glossy paper, envelopes, matte paper in different formats in different sizes up to A4. These features greatly widen the range of tasks that can be performed by this talented kid. Many users in the cities like New-York, Florida, Los-Angeles, Las-Vegas and Calfornia and other high-tech centers, purchase such a home helper for themselves. Why? It's simple. Multi-processing and high speed, which is 33 per minute in mono version and 27 pages per minute in color one, and also much economy in consumption and replacement of ink allow the end user not to have an ordinary multifuncional printer, but a contemporary printing photo station for home usage. Recommended Paper Brands Brother Inkjet Plain Paper (BP60PL), Brother Matte Inkjet Paper (BP60ML), Innobella?вЂћ? Glossy 8.5" x 11" Photo Paper (BP61GLL); Innobella?вЂћ? Glossy 4" x 6" Photo Paper (BP61GLP), and 3M 3410 Transparency Film. Minimum Paper Width/Length (Paper Tray) 3.9"/5.8"
Maximum Paper Width/Length (Paper Tray) Legal 8.5" x 14.0"
Sheet Weight - Paper Tray (max/min) 17-58 lb. Unit Dimensions (W"xD"xH") 15.4" x 14.4" x 5.9"
Unit Weight (lbs) 15.7 lbs.